Terriers scored early and they scored late in a 5-2 win against New Hampshire at Agganis Arena. Senior co-captain Dante Fabbro and freshman Joel Farabee led the way as each scored a goal and added two assists. 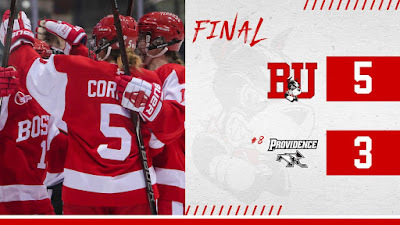 The win puts BU in fourth place in Hockey East, a point ahead of Providence whom they’ll take on tonight at Schneider Arena. Just as in Tuesday’s game at Harvard, BU got a goal two minutes into the contest and again it was a freshman’s first tally. On the rush, Jack DeBoer completed a give-and-go with senior Ryan Cloonan, deflecting the return pass past UNH’s Mike Robinson. Then, with BU on a power play, Fabbro took a pass from sophomore Shane Bowers at the right point, skated to his left and wristed the puck home with Bowers screening Robinson. Farabee also assisted. Farabee nearly made the score 3-0 in the middle period when he clanged a shot off the right post on a partial breakaway. But New Hampshire dominated the period and cut the lead in half at the ten-minute mark. Liam Blackburn converted the rebound after Jake Oettinger made the initial save on an Ara Nazarian shot. The Wildcats knotted the score early in the third period. Blackburn, unmarked in the slot, took a pass from behind the BU net and beat Oettinger high to the glove side. 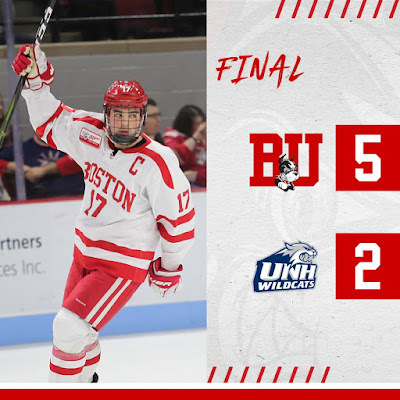 BU replied two minutes later when Farabee took an indirect pass from sophomore David Farrance as he skated into the UNH zone and wristed a bullet from the left circle past Robinson on the glove side. Later in the period sophomore Ty Amonte made slick pass to classmate Cam Crotty breaking to the net from the right point. Crotty beat Robinson, extending the lead to 4-2. Junior Patrick Curry also assisted. Just a minute later, Bobo Carpenter closed out the scoring with his team-leading 10th goal. On the rush, Farabee dropped a pass to the senior co-captain, who ripped a shot from the right circle past Robinson’s glove. Sophomore Logan Cockerill had the second helper. Oettinger was strong in goal again, stopping 25 of 27 shots. 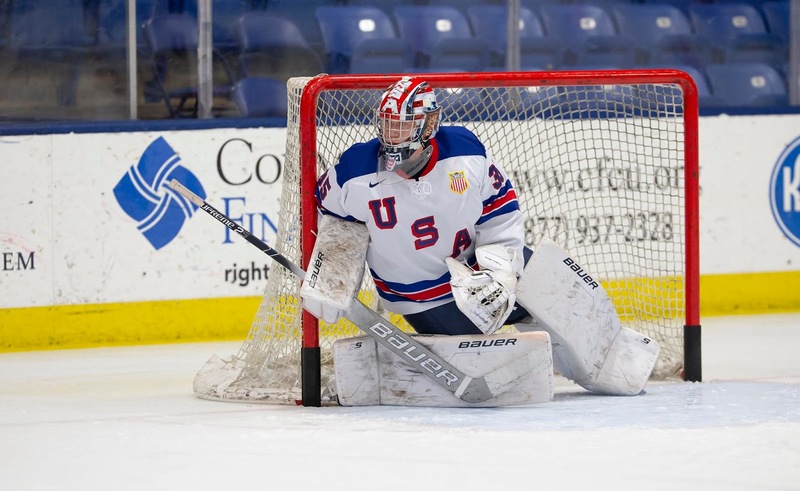 2020 recruit Drew Commesso stopped all 23 shots he faced to lead the NTDP U17s to a 1-0 win against Central Illinois. Commesso, who earned his ninth win, was the game’s first star. Fellow recruit Dylan Peterson assisted on the game’s only goal. Terriers broke a 3-3 tie late in the third period on goals by Nara Elia and Deziray DeSousa and went on to defeat Providence, 5-3, at Schneider Arena. The win gave BU seven wins in the past 10 games (7-2-1). BU jumped out to a 2-0 lead on a pair of Sammy Davis goals a minute apart midway through the opening period. The Friars scored last in the first and then early in the second to tie the score, but Emma Wuthrich wristed home a shot from the right circle to put the Terriers back on top after two. Midway through the final period, Providence tied the game again. Less than three minutes later, Elia potted her sixth goal, taking a pass from Kristina Schuler in the crease. DeSouza, who also assisted on the game-winner, closed out the scoring in the final minute. Corinne Schroeder stopped 26 shots for BU. The two teams will complete the home-and-home Saturday at Walter Brown Arena, with puck drop at 3 p.m.
Fabbro is a junior, but hopefully he’ll stick around for senior year!